This is the final weekend to see “Egypt’s Sunken Cities” at Mia, an exploration of ancient Egyptian art and beliefs unprecedented in recent decades. But Egypt didn’t cease to exist when its ancient religion did, of course—its modern history is no less fascinating and complicated. So here are 10 book suggestions from Shaden Tageldin, an associate professor of cultural studies and comparative literature at the University of Minnesota, who recently spoke at a sold-out event on Egyptian literature and Alexandria at Mia. Most are novels. Two are literary memoirs. All of them open evocative windows onto modern Egyptian history and everyday life. 1) No One Sleeps in Alexandria by Ibrahim Abdel Meguid, translated by Farouk Abdel Wahab. (American University in Cairo Press, 1999.) A sweeping novel about diverse yet intertwined lives in Egypt’s “second city” of Alexandria—often romanticized in the West, seen here from an authentically Egyptian perspective. 2) Out of Egypt: A Memoir by André Aciman. (Picador: Farrar, Straus and Giroux, 2007.) A richly imaginative memoir chronicling a larger-than-life Jewish family from its arrival in Egypt at the turn of the 20th century to its exodus several generations later. 3) Dongola: A Novel of Nubia by Idris Ali, translated by Peter Theroux. (University of Arkansas Press, 1998.) The first Nubian novel ever translated imagines a modern Nubian striving to stay above water—literally—in Cairo while dreaming of the lost capital of medieval Nubia, now buried beneath the floodwaters of the Aswan Dam. 4) The Lamp of Umm Hashim and Other Stories by Yahya Hakki, translated by Denys Johnson-Davies. (American University in Cairo Press, 2004.) A terrific collection of short fiction from a writer who brought distinctly Western literary ideas to the traditions of classical Arabic literature in the mid-20th century, including the title story about wrestling with divergent cultures. 5) The Days: His Autobiography in Three Parts by Taha Hussein, translated by E. H. Paxton, Hilary Wayment, and Kenneth Cragg. (American University in Cairo Press, 2014.) One of the Egypt’s most celebrated writers and scholars documented his life in three volumes, starting in the late 1920s with reflections on his childhood in rural Egypt and concluding more than 40 years later with the story of attaining his doctorate in France against all odds. 6) City of Saffron by Edwar al-Kharrat, translated and introduced by Frances Liardet. (Quartet Books, 1989.) A novel about a sensitive and clever young Coptic Christian boy growing up in Alexandria in the 1930s—a close parallel to the author’s own experience. 7) Girls of Alexandria by Edwar al-Kharrat, translated by Frances Liardet. (Quartet Books, 1993.) A follow-up to the City of Saffron, returning to the same city and main character in an experimental exploration of the walls of consciousness that separate us and the irresistible urge to communicate. 8) Miramar by Naguib Mahfouz, translated by Fatma Moussa Mahmoud. Edited and revised by Maged el Kommos and John Rodenbeck. (Anchor Books, 1993.) An absorbing novel from a Nobel Prize-winning author about a servant girl working in a boarding house in 1960s Alexandria, and the residents fighting for her affection or allegiance. The story is told four times, each from the perspective of a different resident. 9) The Cairo Trilogy: Palace Walk, Palace of Desire, Sugar Street by Naguib Mahfouz, translated by William Maynard Hutchins, Olive E. Kenny, Lorne M. Kenny, and Angele Botros Samaan. Introduction by Sabry Hafez. (Everyman’s Library [Knopf], 2001.) The Nobel-winning author’s celebrated trilogy of colonial Egypt, gathered in one volume. The novels follow the story of a patriarch and his family from the time of the Egyptian Revolution in 1919 through World War II. 10) The Open Door by Latifa al-Zayyat, translated by Marilyn Booth. (American University in Cairo Press, 2000.) This 1960 novel, often called a feminist classic, took on the misogyny in Egyptian society as it follows a young woman rebelling against stifling sexual and political norms just as Egypt itself attempts to free itself from colonial rule. 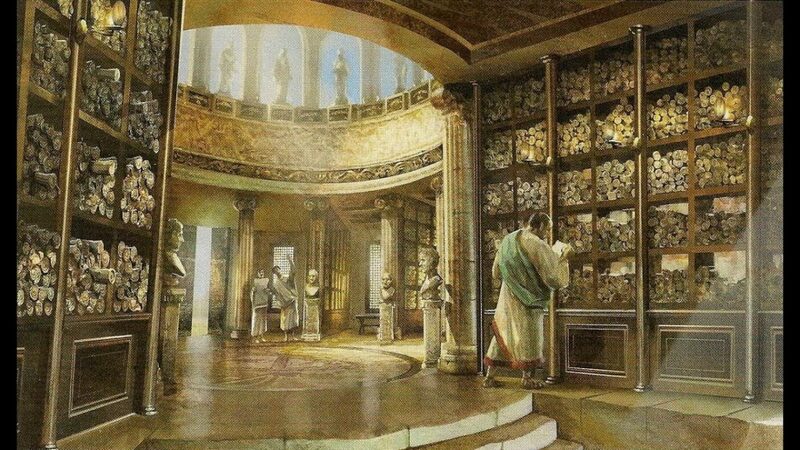 Top image: an artist’s conception of the lost library of Alexandria.